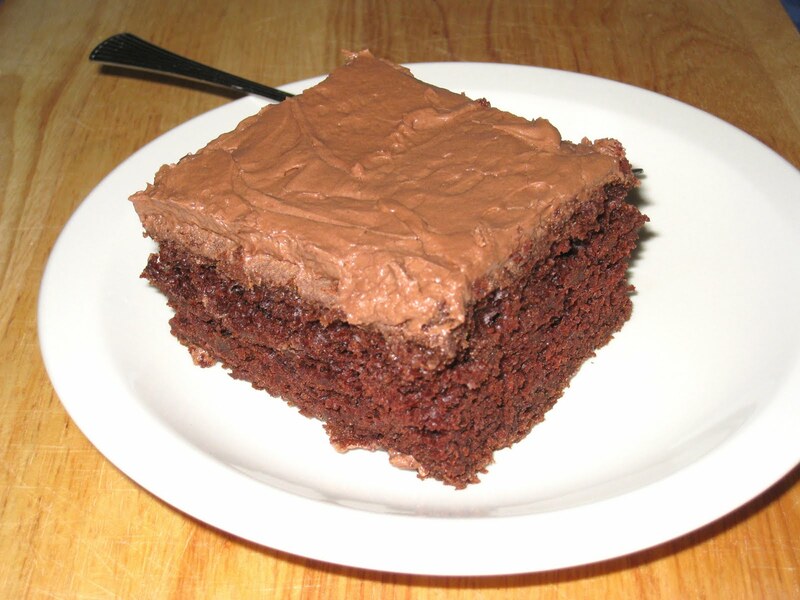 This chocolate cake recipe has been in my family for years. I don't know from whom my mother got it, but it's the first cake I remember eating. I'm pretty sure it didn't come from my grandmother, because her signature cake was a yellow cake filled with jelly and covered with chocolate frosting. That was a cake I actually liked, but I think I was the only one. Everyone else in my family was grossed out by the jelly filling, which was a pretty common thing back in my grandmother's day. Wherever my mother got it, the chocolate cake became THE cake for every family celebration (except for my younger brother and me, but that's a different story). Rich and filled with an intense chocolate flavor, it is one of the best chocolate cakes I have ever eaten. In those days, women usually had one or two recipes that they did not share. It was the recipes that were show-stoppers, dishes that defined them, made them special. For my mother, it was this chocolate cake recipe. She guarded it carefully, and as each of my sisters and I came of age to make it ourselves, we had to promise not to share it with anyone else. And I never did. And friends would ask. They would be disappointed when I wouldn't give them the recipe, but they understood. The only exception my mother made was for my friend Mary, who wrote her the most lovely letter begging for the recipe and promising not to give it to anyone else. That is the only time that I know of that my mother allowed the recipe outside of the family. She even balked at giving it to my sister-in-law, although she finally did in the end. The original recipe was for a single layer, and is actually quite similar to the chocolate cake recipe I found in Laurie Colwin's More Home Cooking and wrote about here. There's also a version of this cake that I found in James Beard's American Home Cookery. I'm pretty sure they are all variations of the same cake. When my sister and I first decided to make the cake, we followed the recipe diligently, but the layers came out thin and barely rose. It tasted good, but just wasn't big enough. Same problem with the second attempt, at which time my mother said, "You doubled it, right?" and we said "What?" It turns out she had been doubling the recipe for so long that she didn't even think about it, so didn't mention it to us. And then there was my whole wheat phase, which produced the heaviest brick of I don't even know what that swallowed up all of the chocolate and sugar and tasted worse than carob. I only made that mistake once. I don't make it as often as I used to, since I moved away from home and family. But whenever the opportunity arises, I will whip it up for a birthday or other special occasion. My mother always made a layer cake with the recipe. I found that a sheet cake traveled better, and it also makes lovely cupcakes, which are excellent for Halloween with orange icing. But I will always think of it as our family birthday cake. Which is why I baked it today. Happy Birthday, Anne. Sift or whisk together the flour, sugar, cocoa, soda and salt. Add the rest of the ingredients and mix well, either with a hand beater or by hand. Pour into a greased 9 x 12-inch sheet pan. Bake 350 degrees for 20-30 minutes, until a toothpick stuck in the center comes out clean. If desired, you can pour the batter about halfway up two greased 9-inch cake pans, and use the rest to make 6 cupcakes, and make a layer cake. Or, you can make cupcakes (about 24), in which case check them after 20 minutes as they will cook faster than the cake. Place the butter in a large bowl to soften. When soft, add about a cup of powdered sugar, 1/3 cup cocoa, vanilla, and a few tablespoons of milk. Mix well and check for consistency and taste. Add powdered sugar, cocoa, and/or milk as needed to reach the desired consistency. It should be fairly thick, but spreadable. Thanks for the recipe. Is this a doubled recipe already? Yes, the recipe is already doubled.